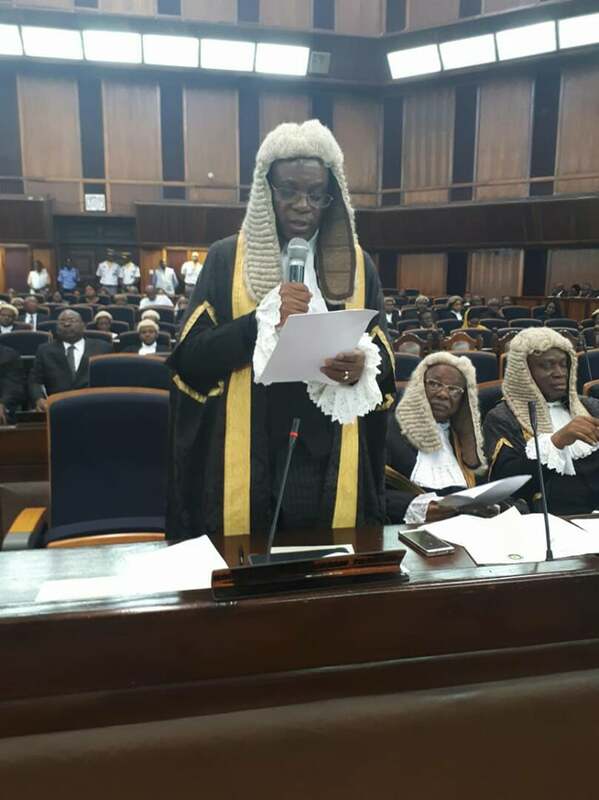 A special session of the Supreme Court was held today in honour of Late Honourable Justice Paul Nwokedi who died on the 3rd of September 2017. Paul Usoro SAN who was officially requested by the President of the NBA, Abubakar B Mahmoud SAN to represent him and the entire bar delivered a heartwarming tribute that demonstrated leadership,experience,intelligence and excellence. The Nigerian Bar Association today mourns with the Nigerian Nation, the passage of one of our icons and beacon of hope, the late Honorable Justice Paul Kemdilim Nwokedi, CON. In mourning His Lordship, we also celebrate his life and give thanks to God for a number of reasons. For one, we thank God that His Lordship lived a full life and passed on at 90 years having seen his succeeding 3 generations – his 5 children, grandchildren and a great grandchild. That is not given to all. His Lordship evidently passed on, on 03 September 2017, a contented man, having raised successful succeeding generations, amongst them, our colleague and member of the Inner Bar, Uche Gringory Nwokedi, SAN. Even though His Lordship passed on 2 months shy of his 91st birthday which would have been marked on 03 November 2017, His Lordship lived well beyond the three score and 10 years that is given to man and this, by itself is cause for celebration and thanksgiving. For us as lawyers and members of the Nigerian Bar Association, His Lordship’s life remains a mirror and an exemplar. In x-raying His Lordship’s life, we perhaps should start from the middle and recall that His Lordship had a very successful stint as a private legal practitioner in a partnership that was then known as P. K. Nwokedi, Ibianwu, Okolie & Co before joining the Bench in 1974 in the then East Central State of Nigeria. 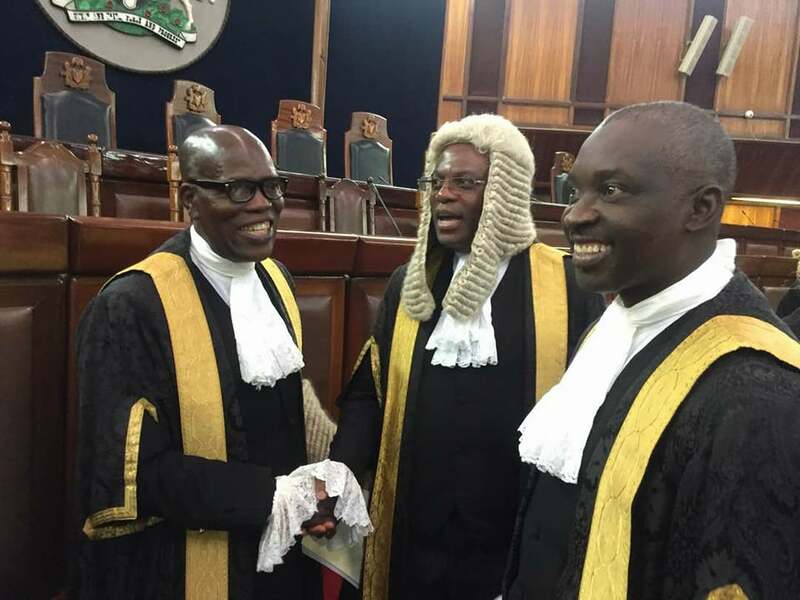 The Bench is traditionally enriched by the diversity of its members’ backgrounds and experiences, constituted as it most often is by legal practitioners coming inter aliafrom the private and official bars, the lower bench and the academia. Sometimes, making the leap from the private bar to the bench warrants real sacrifice and deprivation particularly where the practitioner was adjudged by his peers to be running a successful legal practice. 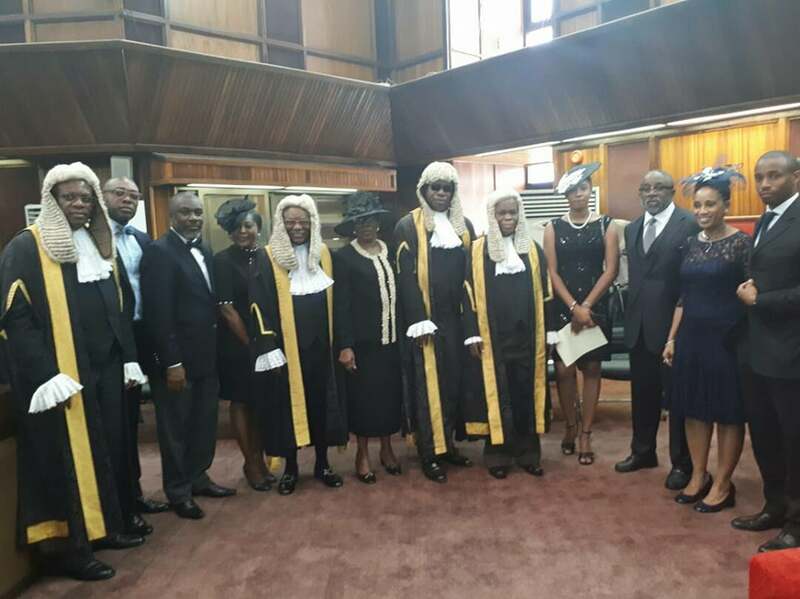 Honourable Justice Nwokedi made that sacrifice and was a stellar example of the service calling that compels or propels the successful private legal practitioner to abandon his lucrative private practice for service on the Bench. It is a tribute to His Lordship’s hard-work, intellect and competence that in 1985, about 11 years after his appointment as a Judge, he was found worthy of further elevation to the position of Chief Judge of the old Anambra State which then comprised the current Anambra, Ebonyi and Enugu States. We however celebrate His Lordship today as one of the extremely few jurists who successfully made the transition from the High Court Bench to the apex Court Bench as a Justice of the Supreme Court without intervening service years as a Justice of the Court of Appeal. The ranks of those Justices who made that leap included Oputa JSC, Kawu JSC and Usman JSC and of course Honorable Justice Paul Kemdilim Nwokedi. His Lordship was elevated to the Supreme Court in 1990 at the time that the mandatory retirement age for Supreme Court Justices remained fixed at 65 years. Thus, did it happen that His Lordship spent a rather brief period at the Supreme Court, retiring therefrom in 1991. But then, those few years were memorable, with His Lordship leaving his mark and pronouncements in the annals and sands of the Supreme Court and indeed our jurisprudence. “Much as one would welcome development projects in the community, there must be caution to ensure that the fundamental rights of a citizen are not trampled upon by popular enthusiasm”. These immortal words are as relevant, applicable and germane today as they were in 1991 when His Lordship pronounced them. Those words speak to all circumstances and incidents when and where fundamental rights of a citizen may be threatened “by popular enthusiasm”. As His Lordship reminded all of us, in Agbai v Okogbue (supra) “these rights have been enshrined in legislation, that is, the Constitution”. These rights are protected even in circumstances where public sentiments, described by His Lordship as “popular enthusiasm” presses for their abridgement. The “popular enthusiasm” that provided the excuse for the abridgement of the appellant’s fundamental rights by the respondents in that appeal was a “community development” project promoted by an age-group in the appellant’s village. Laudable as the scheme was, His Lordship had no hesitation in striking down the aspect of the community’s custom that constituted an infringement on the fundamental rights of the appellant. This indeed is an object lesson for all of us vis-à-vis“popular enthusiasm” that sometimes threatens the rule of law and the fundamental rights of citizens. “One then asks what is the manifest intention of the Wills Law of Bendel State. The obvious answer is, to give generally testamentary capacity to “every person” of that State. If Dr. Odje’s construction is applied, every Bini citizen is deprived of this testamentary capacity thereby frustrating the object of the Law. From the evidence adduced and on the authority of Olowu v Olowu above, on the death of a Bini, all his estate is vested in his eldest surviving male child. Acceptance of the construction advanced by Chief Williams would help to further the objective of the Law. Indeed, the facts of that Appeal related to Bini customary law vis-à-visthe provisions of the Wills Law, Cap 172 of Bendel State, but the principles that were pronounced upon by His Lordship and which were applied for the determination of that appeal, were and are of universal application and apply equally to interpretation of statutes generally. 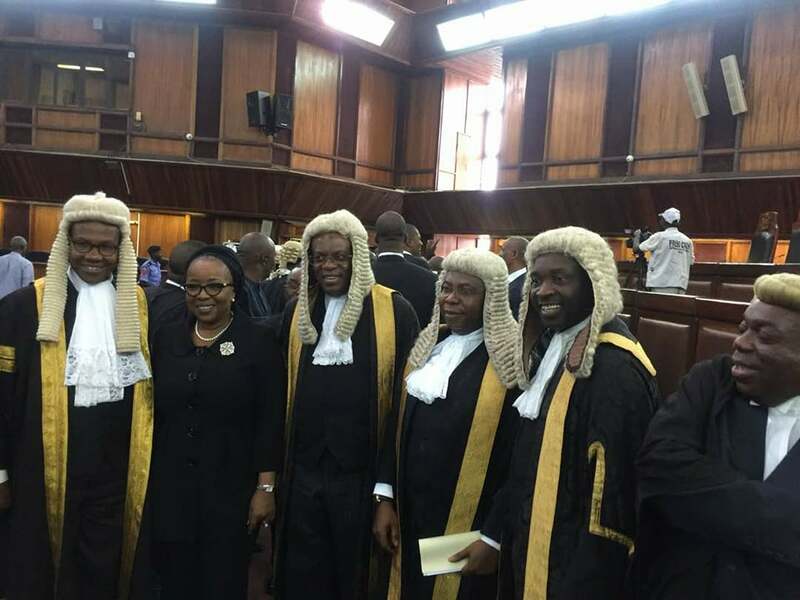 These principles are particularly relevant and applicable in circumstances that Your Lordships are called upon, on a daily basis, to interpret and apply legislation, sometimes in manners and in matters that could impact upon the fundamental rights of the Nigerian citizens and/or the promotion and preservation of the rule of law. Time and space would not permit me, My Lords, to proceed with any further review of His Lordship’s outstanding expositions in the Supreme Court Bench – and there are several more in our Law Reports. Permit me, My Lords, however, to point out that the common threads which I find run through the judgments of His Lordship, Honourable Justice Nwokedi are his scholarship, his lucidity, the logic in his espousals, his feel for humanity, his sense of history, and, not least, His Lordship’s abiding interest in the use of law for the advancement of the rule of law and the protection of the fundamental rights of citizens. Possibly, if His Lordship was asked the underlying philosophy for his judgments, he would have pointed to his Catholic upbringing and his socialist bent – a rather ironic twist, i.e. His Lordship’s socialist streak, considering that not only was His Lordship born into royalty, but the practice of His Lordship’s chosen law profession, arguably, has aristocratic history and bearings. It would actually appear that law practice, in some form, is and was embedded in the Nwokedi family DNA. His Lordship’s father, Chief Joseph Ndubisi Nwokedi, was a colonial court interpreter who rose through the colonial judicial system to become a customary court judge, working in the different districts of colonial administration in Eastern Nigeria. As an aside, it would have been interesting to know what the older Nwokedi would have thought of his brilliant son’s expositions on customary laws in the two authorities that we have reviewed in this Tribute! The older Nwokedi went on to become the 3rd Uthoko of Achalla and was married to Mercy Nwaugoye, the mother of Honourable Justice Nwokedi, herself, from the royal Amobi family of Ogidi. Thus, when we say that His Lordship was born into royalty, we speak, not only of the older Nwokedi but also of his wife, the mother of His Lordship. Honourable Justice Nwokedi’s brilliance shone through quite early in his life. His Lordship had his primary education at St. Joseph Catholic School, Onitsha and Holy Trinity Primary School Onitsha. From there, he gained admission to the prestigious St. Gregory’s College, Lagos where he excelled in academics and passed the Cambridge Senior School Certificate in 1945 in Division 1 with exemption from London Matriculation. His Lordship studied on his own to earn a University of London BA degree in History in 1951 – a rare feat then and even now. He subsequently proceeded to the London School of Economics to study Law and graduated in 1959 with an LL.B degree. He passed his Bar Finals (Part II) and was published as a member of the Honorable Society of Lincoln’s Inn in 1959 and thereafter returned to Nigeria where he went into private legal practice in Aba. Not to be forgotten is the fact that His Lordship was a devout and practicing Catholic – we have already mentioned this as His Lordship’s possible abiding philosophy in his Judgements. In his post-retirement years, His Lordship devoted his life particularly to seminarians and charity works. As we mourn the physical passage of Honorable Justice Nwokedi, we are comforted that he remains alive in his succeeding generations but more importantly, in our hearts and in our Law Reports. His Lordship indeed comes alive daily each time his pronouncements are read by and/or inculcated in our law students in the various Law Faculties of our Universities and the Nigerian Law School or cited by Your Lordships and lawyers in the various court hierarchies of our land, starting from the magistracy right up to the Supreme Court. That indeed is what it literally means to live in the hearts and minds of succeeding generations and that is a most befitting memorial to His Lordship. He cannot and will never be forgotten; he lives on, with us. That is and should be a consolation to his immediate family and indeed to all of us even as we pray for the forgiveness of his sins and his gentle repose.